A couple of years ago, I started my 101 recipes in 1001 days challenge. A lot has happened in the last 1001 days of living. It’s hard to believe! Last night, on the 1001st day, I baked my last recipe. Woohoo! It’s been such fun. My goal was to learn how to make a variety of recipes, most of them being staples or the homemade version of store bought goods. All in all, it was a smashing success. 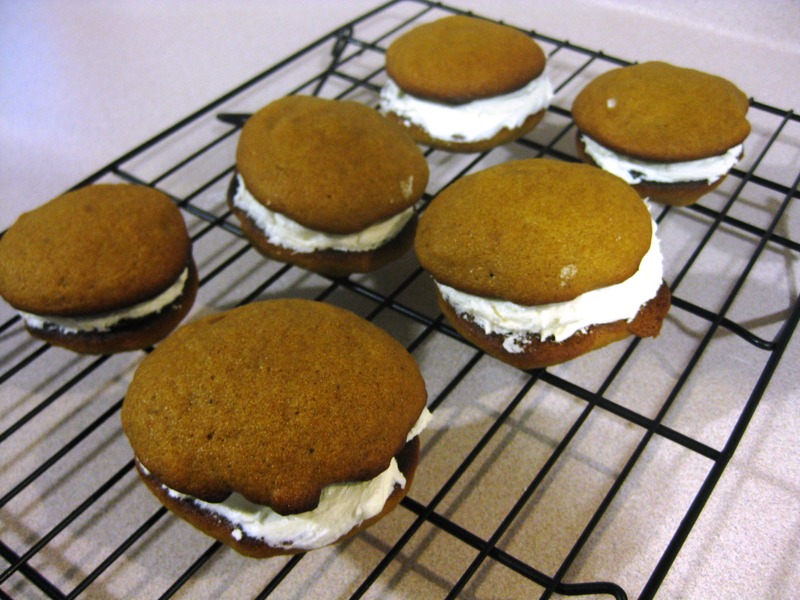 My final recipe on the list was pumpkin whoopie pies. I bookmarked this recipe a couple of years ago, and it’s taken me until now to make it happen. I had no idea what I was missing out on! Bob’s verdict: NEVER lose this recipe. And so, my friends, it’s a keeper. Recommendation: don’t over-bake them! Even at 9 minutes, mine were a little bit too dark on the bottom. Next time, I’ll start checking at 8 minutes.